FRANKFURT -- Volkswagen AG reached a landmark agreement with workers to cut as many as 30,000 jobs globally and save 3.7 billion euros (Cnd $5.3 billion) in expenses as the company tries to claw back from its emissions-cheating scandal and invest in electric vehicles. Reducing headcount by nearly five per cent will come through attrition as the automaker agreed to refrain from forced layoffs until 2025, the German company said Friday. After months of intense talks, labour and management agreed on a package to balance cost-cutting with investment as the auto industry shifts away from traditional combustion engines and adapts to car-sharing services and self-driving technologies. "This is a big step forward, maybe the biggest in the company's history," VW brand chief Herbert Diess said at a news conference in Wolfsburg. "All manufacturers must rebuild themselves because of the imminent changes for the industry. We need to brace for the storm." The labour agreement is critical to Volkswagen's efforts to accelerate restructuring at its biggest unit and emerge from the worst crisis in its history. The VW brand, which accounts for almost half of the group's sales, was struggling even before the emissions crisis erupted last year, tarnishing the carmaker's reputation and burdening the company with at least 18.2 billion euros (Cdn $21.6 billion) in costs for fines and repairs. About 23,000 of the jobs will be cut in Germany. Jobs also will be eliminated in North America, Brazil and Argentina, VW said, without being more specific. In a concession to workers, the manufacturer agreed to build two electric cars at German sites, one in Wolfsburg and one in Zwickau. The company, which employs 624,000 people globally, will add as many as 9,000 positions for future-oriented projects such as electric vehicles and digital features. The job cuts will come through early retirement and not replacing workers that leave. The savings comprise 3 billion euros (Cdn $4.3 billion) at its German factories and another 700 million euros (Cdn $1 billion) abroad. Weighed down by unwieldy labour contracts, a bloated lineup of vehicles and a convoluted structure, the VW brand has struggled with weak profitability. In the first nine months, the unit's operating profit margin narrowed to 1.6 per cent from 2.8 per cent a year earlier. The goal of the labour agreement is to reach a four per cent profit margin by 2020. The deal was a prerequisite for Volkswagen's plans to push ahead with investment in new models and upgrading factories. The labour talks, which started in June, went down to the wire, with the supervisory board meeting on Friday to approve the company's budget for the coming years as it pushes to sell as many as three million electric vehicles a year by 2025 and expand in services like ride-sharing. 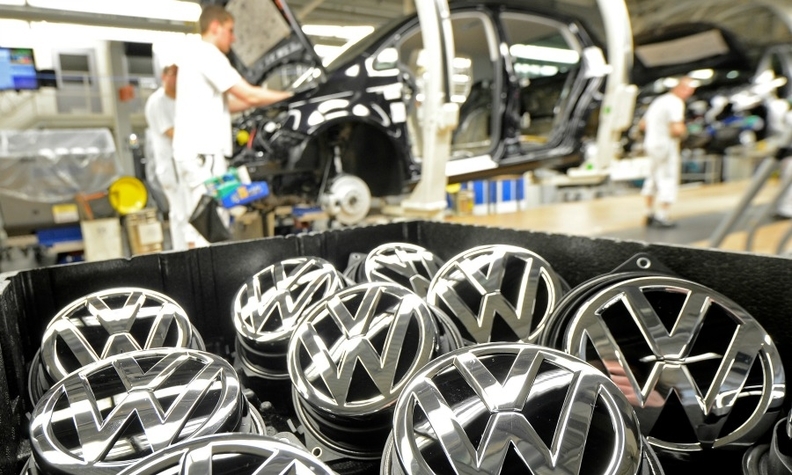 Volkswagen is under pressure to reduce annual capital expenditures, which currently stand at 12 billion euros (Cdn $17.2 billion), making the company one of the biggest corporate spenders in the world. Analysts and investors welcomed the deal. Hedge fund TCI, which has been critical of Volkswagen management, said it looked like a good deal all round provided it could be made to stick. "As long as they are net savings -- the savings are not given back by increased costs elsewhere in the organization," said TCI partner Ben Walker. "They've just to deliver now. It's easy to talk. They now have to deliver and execute," he added. labour leaders were pleased with the outcome. "The most important message is the jobs of the core workforce is secure," Volkswagen's powerful works council chief Bernd Osterloh said at a news conference in Wolfsburg. "We have agreed that forced redundancies are ruled out until end 2025. When I see what is going on at other companies, this is a big success in difficult times," Osterloh said.